Alaska Company, celebrating over 25 years of manufacturing fireplaces and stoves, introduces the Kodiak. 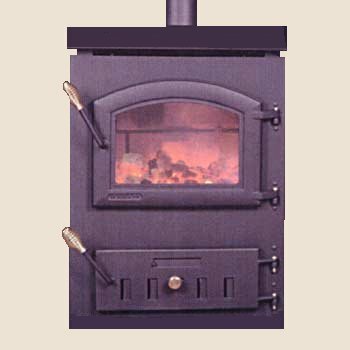 A top load, gravity fed anthracite coal stove that can heat for 3 days without refueling! This is made possible by these exclusive Kodiak features: "Fire in the Round" draws to your attention that the Kodiak is a round grate stove. With a round grate you get a more precise, smoother, raking action; and you can't dump your fire accidentally. With a round grate you get a special built in dump mechanism absent on all other square grate stoves. And our round grate guarantees that our large ash pan covers the entire grate area - side to side - front to back. Exclusive "Load View" technology in a Kodiak means there is no unsightly old fashion hopper to see through our beautiful arched glass door. "Load View" can give you up to 50% more coalcapacity than those old fashion hopper fed stoves. Additional details: Kodiak's "Fire in the Round" grate system is 100% cast iron for long life. Others may have cast grates, but use mild steel to hold them in place. Our load door is designed so you can load your Kodiak using a pail. Safety is built in with our clean edge design that prevents the load door from remaining open accidentally. Our beautiful cast iron viewing door carries a big 13 1/2" wide by 9 1/2" high safe ceramic glass. Kodiak's ash door is designed for long life and easy draft regulation. A properly placed baffle is located near the exit flue to prevent heat loss. The Kodiak's baffle is easily removed to check for ash in the pipe- a great benefit for safety. Our secondary air is preheated for greater efficiency. Our secondary air system remains clean and operable because of proper protection and location. Our secondary air is properly distributed so you have the most control of burning with this amazing top load/gravity fed coal stove - Kodiak by Alaska Company. "The People Who Know Coal." Every Kodiak is manufactured to accept the optional blower, optional bimetal thermostat, or optional heat shield for reduced side clearances.